Iraq's interim prime minister Iyad Allawi, just ten days after the coalition transferred sovereignty to his government, yesterday announced new emergency powers. The laws permit him to detain those deemed security risks, impose curfews, and order house-to-house searches. But he can do so only with the approval of the president and both vice presidents and for only limited periods of time. Comments: (1) This is another indication of what the Washington Post calls Allawi's "single-minded focus on issues of security." At his first cabinet meeting, Allawi kept the discussion centered on ways to combat a tenacious insurgency that has wracked this nation. His first public appearance after his appointment was at a military recruiting center. His first out-of-town trip was to an Iraqi army base. And his first official order, announced Wednesday, was a new national security decree allowing him to exercise broad powers of martial rule in rebel strongholds. Allawi seems to understand that he needs to take control of the country before anything else can happen, including democratization, economic development, and cultural revival, and that is welcome news. Throughout this war-ravaged land, where facts are hard to come by, rumor and innuendo can often serve as the most reliable measure of the Iraqi mood. Consider the lurid tale about Iyad Allawi, the new Iraqi prime minister, that made the rounds in the Iraqi capital last week. Late one night before taking power, the story went, Mr. Allawi was not to be found cramming for his new job but instead was in the innards of a Baghdad prison, overseeing the interrogation of a cabal of Lebanese terrorists. No one was talking. "Bring me an ax," the prime minister is said to have announced. With that, the story went, Mr. Allawi lopped off the hand of one the Lebanese men, and the group quickly spilled everything they knew. The tale passed from ear to ear, much like the rumors blaming the Americans for the many explosions that mar the capital. But in this case, the remarkable thing was that the story about Mr. Allawi was not greeted with expressions of horror or malice, but with nods and smiles. After months of terror and anarchy here, many Iraqis are only too happy to believe that their new prime minister is a tough guy who is on their side. Mr. Allawi's hard-nosed reputation, even the unearned parts, is indicative of the unusual ways in which the country's interim government, which took over on June 28, appears to be acquiring a measure of legitimacy among the Iraqi people. Unelected, headed by an exile and chosen largely by diplomats from the United States and the United Nations, the new Iraqi government nonetheless appears to be enjoying something of a honeymoon, even as Mr. Allawi has quickly embarked on a series of sweeping and potentially draconian measures aimed at quelling the guerrilla insurgency. That legitimacy comes from asserting an ability to control Iraq makes sense. This must precede other, more constructive accomplishments. I am a bit hopeful that Allawi might fill the democratically-minded strongman niche that I devised in April 2003. So far, he is showing the strongman side; but does he also have the democratic one? July 13, 2004 update: "Iraq's Leaders Step Up With Tough Talk" reads the Associated Press headline, and tough talk it sure is. President Ghazi al-Yawer announced yesterday that the government has "a very sharp sword ready for anyone who threatens the security of this country." A few days earlier, Prime Minister Iyad Allawi vowed that those who fired mortars that landed near his home "will not only fail, they will be crumbled." Such comments apparently have support from many in Baghdad. "Iraqis can't be ruled without the whip," said Khalid al-Hafith, a 31-year-old cook. "For all our lives we have not tasted freedom. We've wanted it, but we need a strong hand to secure it." 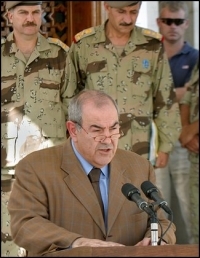 July 20, 2004 update: Interim Prime Minister Iyad Allawi "has developed the aura of a tough, perhaps brutal, leader" and this "has endeared him to many Iraqis," reports Hamza Hendawi of The Associated Press. Salma Abbas, a 50-year-old government employee: "I heard that he goes to jails to kill criminals. This is good. We want someone as strong as Saddam." Hakim al-Yasseri, a gas station manager: "The security situation requires such actions from the prime minister." Feda'a al-Mawla, a postgraduate student at Baghdad's Mustansiriyah University: "Iyad Allawi must hint and give the impression that he too can be Saddam. He is telling everyone that he can be as tough as Saddam. It's giving Iraqis hope." Stories about Allawi contain a consistent message: he is ruthless and will resort to brutality if that's what's needed to assure security in Iraq. These attitudes point to a pervasive desire for calm and the conditioning to expect a tough leader.